Celebrants of the holiday sometimes refer to it as “Festivus for the rest of us,” a saying taken from the O’Keefe family traditions and popularized in the Seinfeld episode to describe Festivus as “another way” to celebrate the holiday season without participating in its pressures and commericalism. Probably my favorite Seinfeld episode! 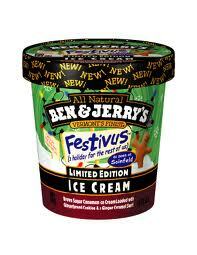 Get some Fesitvus ice cream!